...not something I can easily pass up. I found these remnants at thrift stores, or at the fabric store for 50% off. I collect them to use in art projects. One of the things I'm drawn to is using the lacy fabrics with muslin, canvas, or burlap. You might remember the wire baskets I photographed in another post. I purchased these baskets for a song, and they were yellow! I distressed them to look like vintage locker baskets. She has the best ideas & tutorials for creating "the look" without spending a fortune. Thank you Lisa, I'm so happy with how my baskets turned out! I love the look of all my creamy whites & burlap stored in these baskets. 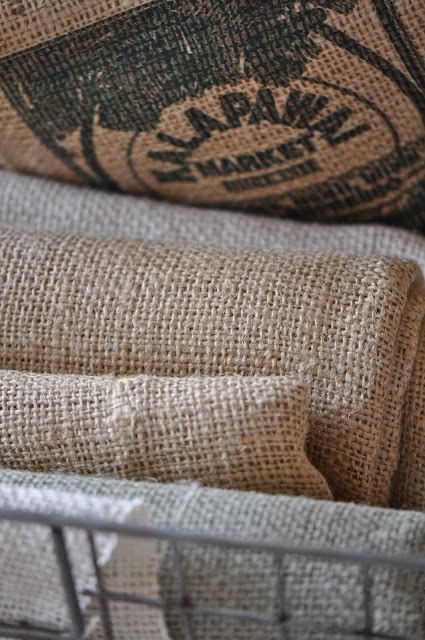 Burlap coffee sacks well, that's just a whole other story...don't get me started...it's an addiction! Now I'm feeling inspired to create something with these beautiful fabrics & textures! How about you? Is there a medium like fabric, or paper or anything else that inspires you to create? I'd like to hear your ideas! So so beautiful - I love these little details. I really like the writing font on your blog. Also the whites are lovely, against the burlap great texture. Thanks for the link to a new blog. Your pictures are beautiful, as usual and I love your wire baskets - very clever to do this yourself. It's surprising how much old, rickety things can cost! I love your new banner Becca! Great fabrics and I love the wire baskets. I love the burlap too. I have a chair I would love to have done in burlap with the writing all over the back! Can't wait to see what you are going to create with all this beautiful white material!! Aw thanks! Your baskets look awesome! I keep fabric in some of my metal baskets too. I love how it looks. It's always so great when something can be pretty and practical at the same time! I love anything with creams and whites together. Like the contrast of the old wire basket with its tea-stained tags and the white towels inside...beautiful photo. Becca, you had me the first photo. I'm such a lover of all shades of white. These are some really pretty photos - very inspirational. Love your beautiful pictures, they are so delicate and romantic!! I look forward to your crafty results using all your pretty finds Becca! Gorgeous photos and fabrics, Becca! The baskets turned out wonderfully...I can't believe they were yellow! Your header looks great! You love material ! so do I. But, to carry on with my patchwork coat, you see on my blog * Les tricots.... *I miss 1 or 2 . Just to bad. No warm colors in samples material to give away. As it is again cold, it would be just as well if I could finish it befor next year Well, well, well. Have you been recently on the blog ? I had done a post about venitians beads ' s trade monney. Usely, Americans love beads. You must have towsen in you country. I remenber havin bought some africans beads on the streets, to Africans. But they where new one. I like them to, I think they have a lot of charme. I will make a post one day about african's made beads. Very clever, recycle glass. Un petit bonjour de Lausanne en Suisse. Please put comment even in english. these are absolutely beautiful, sadly I can't think of anything creative right now! It's all so beautiful. Right now I want to play with all your beautiful texture! Can't wait to see what you come up with. Such gorgeous tones and so beautifully done! i think we have the same burlap addiction. i adore these baskets!!! I don't know, Becca. This is my inspiration, right here. Very refreshing. The lighting, the details - it's so beautiful! Natural. soothing. sigh.